Stewart from SB Models has been developing the SB Scotia range for about the past 4 years. This is my second look at some of the SB Scotia products. I recently reviewed their Steel Boxes Here on Armorama. 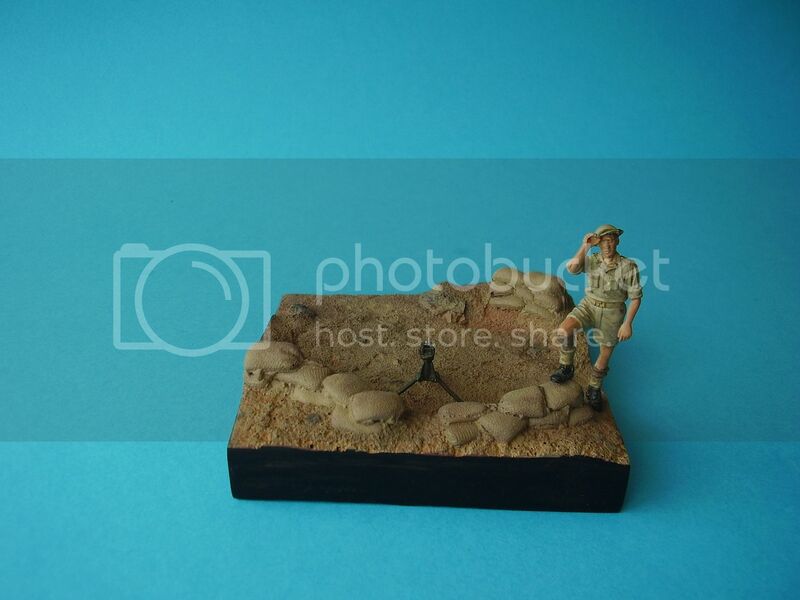 This time it’s a look at a small base depicting a dug in machine gun position. The base comes packed in a sturdy cardboard box and wrapped in bubble wrap for added protection. The top of the box contains the product and manufacturer details and a photograph of the completed item. On the lower side of the box are the contact details for the manufacturer. Cast in a light grey resin the base measures 4 inches x 4 inches and is designed to provide a small setting for a machine gun and crew. The ground work depicts a shallow sunken pit with an earth and sand bag rim to the front and left rear with an opening to the right rear and left center. This will provide a very nice starting point for a stand alone setting and could be mounted on a wooded base for added effect. The overall detail is excellent, the sandbags and ground work look good to me and there are even some footprints in the mud for added effect. You could quite easily fit an MG team into the space, or a mortar for that matter, or simply use it as an abandoned pit with soldiers walking through or troops taking cover. Additionally, if one wanted, you could incorporate the base into a wider setting. The question, ‘Why bother?’ might well get asked. Well very simply this small base comes in at a very reasonable £5.00 and should be of great interest to those with limited time to build their own, and for figure painters who only require a very small setting to mount some figures on. Clean up of the sides should be minimal, the base was free from any major air bubbles or damage so within a short time you can get on with the painting and setting your scene. Normal precautions apply when working with resin. This is a very useable item, limited only by your imagination. It is exceedingly well priced and will save time and effort if a small setting is all you require. 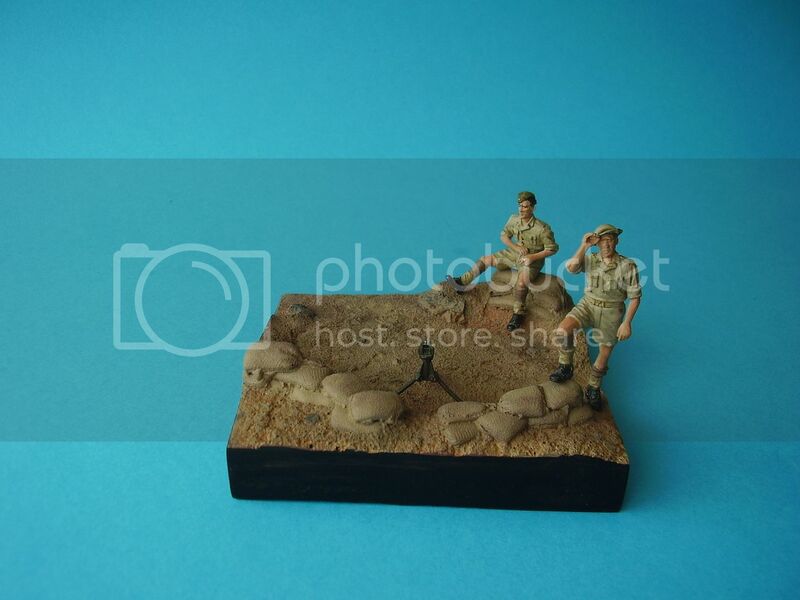 It will also provide a nice template if you are thinking about building your own, and I bought it as a generic base to display some of the many figures and small items I display on this site. I’ve been very impressed with the SB Scotia items I’ve bought so far. This is another home producer with an interesting range of useable and well priced products that I am glad are available. Highs: Well cast with good detail at a very reasonable price. Interesting Alan, If I saw one at a show I might pick it up and build a bigger dio around it. I'm working on SB's Urban Diorama Base at the moment and I must say I was thoroughly impressed when I opened the package- very cleanly cast and full of detail and a perfect size for most 1/35 models. (Fits something about the size on Trumpeter's LMTV very well.) Alan got the review spot on. You can buy SB models stuff at netmerchants.co.uk for decent prices (£6 for the MG position, £13 for the Urban Diorama one) and I would, like Alan, thoroughly recommend them.